Threats of deportation are evolving into a global phenomenon as nativism, racism, and xenophobia sweep the world. All over the world, nations are turning against “foreigners,” particularly against the most vulnerable populations such as refugees, migrant workers, and undocumented immigrants. For example, Pakistan is forcing millions of Afghan refugees born in Pakistan to “go back home.” Myanmar is persecuting the Rohingyas, an unwanted religious minority, pressing them to leave the country. Saudi Arabia has been expelling migrant workers after consuming their labor for years. Right-wing Europeans wish to oust even legal immigrants from North Africa, South Asia, and the Middle East. The United States has escalated its campaign to deport hundreds of thousands of undocumented immigrants. This commentary focuses on the potential deportation of eleven (11) million undocumented immigrants, including six (6) million of Mexican national origin, the largest group of undocumented immigrants living in the United States. These immigrants live in mortal fear of the Immigration and Customs Enforcement (ICE) agents picking them up from work, school, home, hand-cuffing them, putting them in buses and planes, and discarding them out of a country they have made a home for years, if not decades. A Mexican man leaped off a bridge and killed himself after being deported. This cruel expulsion is justified under the popular label of “illegal aliens” and under the rhetoric of removing rapists and criminals. International law in the form of human rights, international criminal law, the humanitarian law of war, regional compacts including the Charter on the Organization of American States, treaty provisions of state constitutions, and universal norms identified in scholarly treatises, all endorse, directly or indirectly, a simple principle that deportation is a crime against humanity. Building on the Nuremberg principles, more recent international treaties and scholarly treatises reaffirm that deportation is a crime against humanity, even if committed in peace times, and even if the deported population is not shipped to slave labor. In addition to apartheid, disappearances, torture, and enslavement, Article 7 of the Rome Statute of the International Criminal Court lists deportation or forcible transfer of population as crime against humanity. Article 4 of the 4th Protocol to the European Convention on Human rights states: “Collective expulsion of aliens is prohibited.” In the United States, courts have reaffirmed the principle that deportation of civilian populations to slave labor is a crime. See Iwanowa v. Ford Motor Co., 67 F.Supp.2d 424, 444-45 (D.N.J.1999). Time is ripe for the US courts to reconsider the deportation of settled communities. This commentary offers the concept of adverse citizenship derived from the prohibition against deportation as a crime against humanity. Several arguments may be offered to challenge the thesis that US deportation of undocumented immigrants is a crime against humanity. First, it might be argued that forced expulsion of only citizens/legal residents could be a crime against humanity and, therefore, the prohibition does not cover undocumented immigrants. Second, the United States is not a signatory to the Rome Statute or a party to the European Convention on Human Rights and the Protocols. Third, no US court has ruled that deportation of undocumented immigrants is contrary to the US Constitution, much less a crime against humanity. In fact, federal immigration laws allow deportation of undocumented immigrants and removal of some illegal aliens under expedited procedures. To cap these arguments, one might point out that if deportation of undocumented immigrants were to be a crime against humanity, nations will surrender their sovereignty to alien invaders. These arguments have some merit under the US notion of sovereignty, as the distinction between legal and undocumented immigrants lays at the heart of US immigration law. But see, The Extinction of Nation-States. Yet, in the case of settled communities, the legal/illegal distinction is elusive, if not abusive to fundamental rights and liberties. With respect to undocumented communities, the US enforces its deportation laws in an arbitrary, cruel and unusual manner, in fits and starts, using the threat and actual removal as an instrument of mental torture, which itself is a crime against humanity. The so-called undocumented immigrants in the United States are living in plain view of the federal government and enforcement agencies, including the Department of Homeland Security, Department of Justice, Congress, and the White House. They are not hiding in caves or mountains. They live and work in big cities and farming towns, in almost all states. Many speak their own native languages, and some undocumented immigrants speak not a word of English because they live in places that once belonged to Mexico and later conquered by the United States through wars. It is no secret that millions of undocumented immigrants have been residing in the United States for decades, giving birth to at least one, if not two, generation of US citizens. The US itself is conflicted over the future of undocumented immigrants. In 2013, a bipartisan Senate bill proposed to provide a path to legal status for millions of undocumented immigrants on the theory (affirmed by the Congressional Budget Office) that such a path could reduce the deficit by $700 billion in 20 years. Some congressional bills instruct the Secretary of Homeland Security not to disclose the identity of undocumented immigrants brought as children to the ICE. Some proposed policies aim at deporting only those undocumented immigrants who have committed crimes, and not others. Only extreme demagogues advocate removing all undocumented immigrants, a task that no one believes can be accomplished. Settled communities with no documents acquire a right to “adverse citizenship’ – a concept I offer for the courts to consider. Somewhat similar (though not exactly) to the common-law doctrine of adverse possession, it might be forcefully argued that undocumented immigrants living for years in the United States, paying taxes, and the federal government having full knowledge of their undocumented status, acquire a right to US citizenship. Such undocumented communities are no different from early colonists who entered America and acquired land and citizenship through adverse possession. Regardless of legal origin, families and communities settled in various states have been participants in promoting the economy and welfare of the United States. A settled Mexican family is no different from a settled Scottish, Czechoslovakian, or Slovenian family. Uprooting settled families, separating children from parents, tearing apart spouses from each other, can no longer be defended under the prevailing norms of human dignity, equal protection, and due process. Deportation is a crime against humanity. Much like genocide, even deportation of part of an undocumented community is a crime against humanity. No notion of sovereignty may be asserted to defend wholesale or partial genocide, apartheid, disappearances, or deportations. In 1986, President Ronald Reagan signed a law that allowed about four million undocumented immigrants to regularize their status. Since 1986, Congress has passed seven amnesty statutes to confer potential citizenship on undocumented immigrants. These amnesties are consistent with international law against deportation and support the concept of adverse citizenship. President Trump’s policy decision to deport undocumented immigrants is a crime against humanity, particularly with respect to families who have settled in the United States for long periods of time, have established homes, or have minor children. It is irrelevant whether these residents entered or stayed in the United States illegally. Deportation of a settled family or community is a violation of the right to life, right to family, right to property, right to privacy, and numerous other rights protected under customary international law, human rights treaties, due process, and fundamental legal principles that sustain the concept of law. 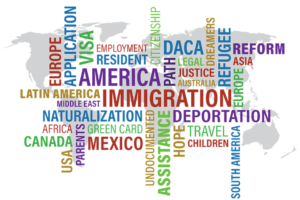 If the US fails to enforce its immigration laws for years and allows families to lay their roots, the balance of equities shifts in favor of resident families to claim adverse citizenship. Through laches, the US loses its power to remove undocumented immigrants openly living, working, and paying taxes for decades.